A classic resort with a long skiing history, linked to neighbouring, equally exclusive Zürs and sharing the Arlberg Pass with ski hedonists heaven, St Anton. Ski School programme includes Carving Ski Guide Ski Safari Snowboarding Telemarking. When will it snow in Lech? 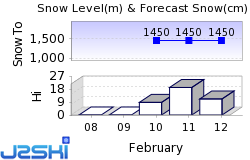 The next notable snow forecast for Lech is 2cm1in, expected on 29 April. The Austrian Ski Resort of Lech is part of the Arlberg ski area with access to 340km211 miles of downhill skiing, with 248 marked pistes, served by a total of 97 ski lifts. In addition to the skiing in Lech itself (260km162 miles of pisted ski runs), the appropriate ski Lift Pass will allow you to ski or snowboard in the other Arlberg ski resorts of St. Anton am Arlberg, St Christoph am Arlberg, Stuben and Zürs. With ski lifts as high as 2,810m9,219ft, skiing and snowboarding is assured throughout the season. Lech was one of the earliest Alpine ski villages, with the first appearance of Telemarking skiers on 'Nordic Planks' here in the 1890s, 15 years before the Alpine variant of skiing, most commonly used today, was invented. In the century since then Lech has quietly established itself as one of the world's greatest ski resorts, having several of the crowned heads of Europe in its list of repeat clientele. Yet the village has done it without shouting from the roof tops and today it attracts the great and the good to its more than 66 four and five star hotels (that's more than twice as many as there are in St Moritz) without very many people knowing about it. Aside from its synonymity with great skiing - the resort has spawned four Olympic gold medalists, most recently Patrick Ortlieb (also 1992 World Champion). The legendary Hannes Schneider attended the first ski training course here in 1906 (Austria's first ski school). Although a cosmopolitan resort today, Lech has also managed to maintain its character, still being owned by the original families from the last century and before and still centred on the old square towered church with its onion dome. They have ensured that the water in the mountain streams remains pure enough to drink, although you don't need to as mineral water comes out of the taps. Apart from the main village itself the Lech community takes in Zug, Stubenbach and ultra-exclusive Zürs, as well as the car-free satellite village at Oberlech (1660m), reached by cable car from the village and an excellent example of doorstep skiing: your accommodation can be reached through tunnels from the top cable car station rather than having to stagger fully loaded over the snow as is the case at some other traffic free centres. The most difficult run is the 'Langer Zug Nr.37'. The Arlberg Ski Area is famous around the world as a destination for serious skiers, and Lech is a key part of it. One of the few ski regions in the world to measure its unprepared trails as well as those mechanically groomed, the Arlberg claims 180km (113 miles) of ungroomed powder slopes on top of the 280km (181 miles) of prepared trails. This breathtaking expanse is currently not quite lift-linked with St Anton, which hosted the 2001 Alpine world Championships, Stuben and St Christoph taking up one half and Lech and Zürs the other. A free ski bus for lift pass holders links the two, and a single pass covers all 85 lifts across both areas. Lift passes are available to overnight guests at a reduced rate (The 'Arlberg Special' ) and the number of skiers on for Lech and Zürs is strictly limited so that when capacity is reached, no more day tickets are sold. The first decision of the morning is whether to warm up on the Mohnenfluh and test the Steinmähder, Hasensprung, Rotschrofen and Weibermahd slopes or to head straight off on to the tough pistes on the Rüfikopf. Beginners at least have the simple choice of the gentle nursery slopes near to the hotels. Experts have a vast selection of off piste trails with guided touring, off piste and heli-skiing also available. 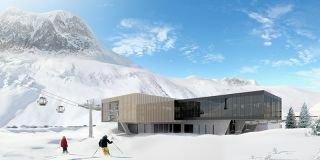 The Arlberg Card, a high-tech ski pass which fits in your pocket, gives the holder automatic access through all turnstiles at the Arlberg's cable car and lift stations. The Arlberg Ski Club, established in 1901 and today one of the world's most famous and most successful, has weekly meetings throughout the season. New members are accepted so long as they have visited Arlberg for at least three years and are recommended for membership by a Club member. The Arlberg offers an overwhelming free ride experience with well prepared slopes for carving and steep slopes and cliffs with untouched powder for the more experienced. We don't currently have confirmed season dates for Lech. NOTE:- Lift and Piste openings are always subject to Snow Conditions in Lech. 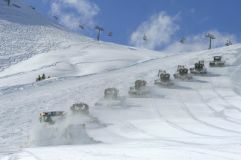 Lech is able to make snow, on 105km65 miles of ski runs, with 96 snow cannons. The 34 ski lifts of Lech are able to uplift 44,600 skiers and snowboarders every hour. Lech is in the Austrian Alps in Arlberg, Tyrol, Austria. The nearest airports to Lech are St. Gallen-Altenrhein, Friedrichshafen and Innsbruck Airport. There are nine airports within three hours drive. St. Gallen-Altenrhein is just one hours drive away, in good driving conditions, so you can be on the piste quickly. The Webcams in Lech are not always up-to-date. Please check the date on the image to ensure you are seeing current snow conditions. Once the ski slopes close Lech's main street turns in to one long après ski bar, with pavement cafes running in to one another in places and Jagatee (tea spiked with rum) the traditional early evening drink. The Tannbergerhof is a popular evening and night spot where the post-skiing tea dance gives way to a late night discothèque, one of four in the village. Want to Know when it Snows in Lech? Click above to get Snow Reports by e-Mail for Lech. By doing so, you agree to Our Rules. Other Ski Areas within Arlberg. Other popular Ski Areas near Lech. Want to ask about skiing and snowboarding in Lech? Or contact Lech Tourist Office. Note :- The information on J2Ski concerning Lech, where not clearly factual, is opinion only and is neither definitive or exhaustive.